Absent from the body, present with the Lord. 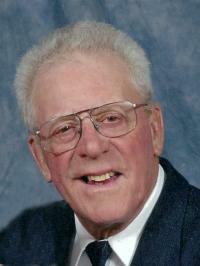 Joe Van Doesburg passed away on the morning of April 14, 2014. He leaves behind his beloved wife, Emma of over 61 years; children Jason (Joan), Lionel (Linda), Miles (Diane), Lana (Wilfred) Taylor and Juliet (Robert) Messelink. He will also be missed by his 20 grandchildren; 10 great grandchildren; 2 brothers; 2 sisters in Holland; numerous family and friends. Joe was predeceased by a granddaughter, his parents and seven siblings. The family thanks the staff at the Grey Nuns Hospital for their compassion and excellent care. Visitation will take place at Foster and McGarvey Funeral Home, 10011 - 114 Street, Edmonton on Friday, April 18, 2014 from 2:00 - 4:00 p.m. A Memorial Service will be held on Saturday, April 19 at 11:00 a.m. at the Orthodox Reformed Church, 11610 - 95A Street, Edmonton with Reverend William Pols officiating.